The Daily Mirror seems to have decided Ed Miliband is a loser. Even at the end of the dark, sad days of the Brown tyranny the Mirror loyally claimed every day that the sun shone out of his fiscal black hole. The paper still bashes the Tories with relish but it betrays no enthusiasm for the Labour leader. 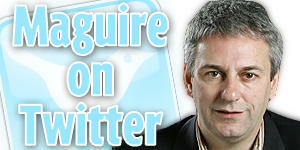 Kevin Maguire is, between breaks from appearing on GMTV and Rupert Murdoch’s Sky News, the Mirror’s political editor. Despairing of Ed he seems to have dropped his usual panglossian prose. On Monday he tweeted from the GMB union’s conference “90.8% of union activists at GMB Congress think Ed Miliband should do better. No jokes please about other 9.2%”. It was the GMB which put Ed Miliband’s picture on the envelope containing the ballot slips that saw him scrape in past his brother David on the back of union votes. If the GMB paymasters no longer back Ed he is in real trouble. Young Miliband’s picking a ­needless fight if he insults loyal members and treats steadfast unions like lepers. The lifeblood of Labour is its members and they deserve to be heard clearly, not muted or ignored. Maguire has always been in the Balls camp and is a drinking buddy of Damian McBride, who is now back in Westminster lobbying for more taxes to be sent overseas in foreign aid. The old gang seem to be readying to do what they do best: undermine a Labour Party leader.